A mature and stable architecture with emphasis on distributed services, container services, big data and analytical tools. Large enterprises require mature and stable architectures. This includes a special need for distributed services, container services, big data applications, and analytical tools to make data-driven business decisions. At the same time, a major concern with architects is how to enable and optimize technical architecture to support rapid business development. Complete protection from heavy traffic cyber-attacks, malicious order placement, and scams are ensured through effective cyber security solutions and anti-fraud services. Application services such as Container Service for hosting micro service architecture, Simple Log Service for centralized log management, Performance Testing for website load testing, and OpenSearch to develop search engines cater to different needs for e-commerce enterprises. To process a massive amount of data generated by e-commerce businesses, Alibaba Cloud provides efficient big data analytical capabilities and processing tools based on Alibaba Group’s business practices. 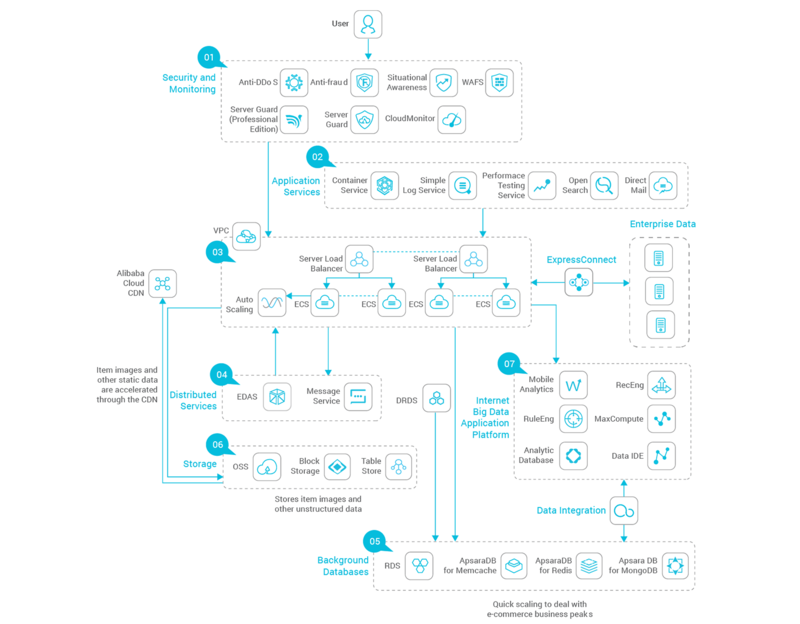 This architecture includes services such as AnalyticDB, MaxCompute, and MobileAnalytics for seamless functioning of big data workloads. All computations run in the sandbox to ensure high security and data reliability. These services eliminate the overhead of manual management of resources and reduce the costs of implementing data warehousing and business intelligence. Server Load Balancer eliminates SPOFs while VPC helps e-commerce enterprises construct isolated network environments based on Alibaba Cloud. EDAS helps e-commerce enterprises build and host distributed application service systems and DRDS carries out extensive database resizing. ApsaraDB for Redis provides online storage services, giving fast response to primary product data and other popular data. A recommended cloud architecture for large e-commerce companies.